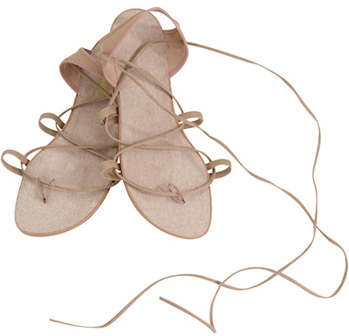 These lovely and versatile Hermes dance sandals/dance shoes by Danshuz are perfect for your performance! Protect your feet! These lovely and versatile Hermes Sandals by Danshuz are an excellent choice for your performances! These are also a great addition to many Halloween costumes. Made with synthetic loops/straps and stitched suede full leather sole. Sizes run by Women's American. These unique dance shoes are perfect for belly dance, Bollywood, lyrical dance, and more! I ordered these in an effort to get a decent pair of shoes to dance in at practices and performances, and have been completely satisfied. I was also very happy that my size was available, and the note about these running a size large was correct. I normally wear a size 5 shoe, so ordered the size 4. They are perfect. these are great, look just like the picture, am excited to wear these for added ethnic flair! Q: i wear a womens 8 US, what size should i order in these? A: Hi D, Thank you for your question. These shoes run large - choose half to a full size smaller than your shoe size. (Example: if you normally wear a women's size 8, choose size 7.) For future reference, detailed information on each item can be found in the Description box located below the photo on the product page. I hope this helps. A: Hi Donna, Thank you for your question. These shoes run large - choose half to a full size smaller than your shoe size. Since you normally wear a 6.5/7, you might choose size 6. For future reference, detailed information on each item can be found in the Description box located below the photo on the product page. I hope this helps.